This was first posted in May of 2009. Go to Why Isn't Steve Garvey In The Hall Of Fame?. It has generated comments every few months, so if people are interested I thought I would post it again. What I tried to show was that he seems to be the kind of player the writers like to vote in and that you could make a good case for him, that is, write an impressive plaque. But he has not made it. I don't think he was good enough, but the puzzle is why he has not made it. The first link tells you the batting average (AVG) and isolated power (ISO) each year in the AL for both close and late hitting vs. non-close and late hitting since 1950. All data from Retrosheet. This next link simply shows the differences in each stat between the situations in both leagues. Numbers in red are positive or zero. Those pretty much stopped in the 1980s. 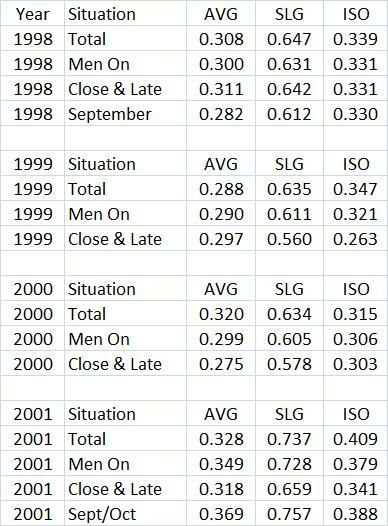 That is, since 1990, AVG and ISO have pretty much been lower in the close and late situations than otherwise. 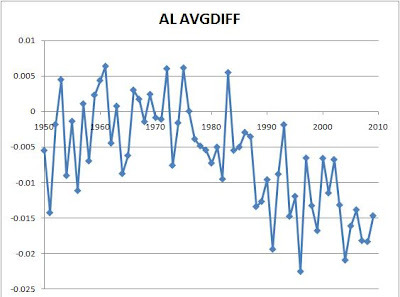 The graph below shows the annual difference in AVG in the AL. The next two graphs do the same thing for the NL. Was It Easier To Be A Good Clutch Hitter In The "Old" Days? 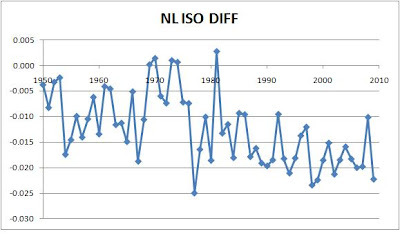 I first reported on this issue in a post last year Did The Increased Use Of Relief Pitching Cause A Decline In Clutch Hitting? Back in the 1950s and 1960s, as I show at this earlier post, hitting in non-close and late situations was not much better than in close and late situations. But, as I also showed, as the use of relief pitching grew, batting averages and isolated power started to decline, relatively, in close and late situations. So it looks like it might have been easier to hit well in the clutch in the "old" days. 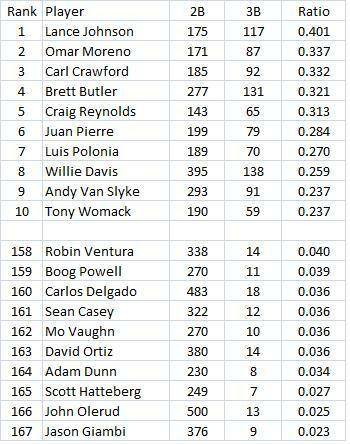 Recently Tom Tango (aka tangotiger) had a post titled Best and Worst Clutch Hitters of the Retrosheet era . Tom has a clutch stat based on WPA or "win probability added." The idea there is that every plate appearance by a hitter either increases or decreases his team's probability of winning. A HR with the score tied in the bottom of the 9th has more impact than one in the first inning with the score 10-0. But Tom adjusts this by how often a hitter gets to hit in "high leverage" situations. Then that it is compared to what his WPA would be if he always hit in average leverage situations. I hope I got that right. But, of course, Tom explains it much better. That stat ends up telling us how many more games a player's team wins (or loses) because he hits better or worse in high leverage situations than he does overall. It is just called "Clutch." To see if this stat changed over time, I took all the players with 4000+ PAs from 1950-2009 and found their Clutch/PA (758 players). 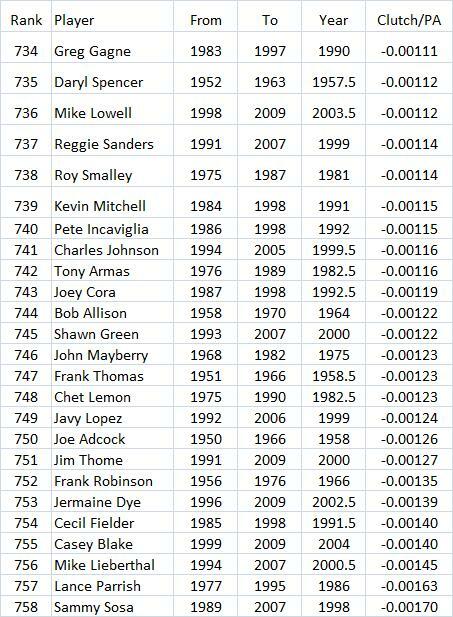 Then I found the the year which was the mid-point of each player's career (the data all comes from Baseball Reference which showed the first and last year of each guy's career). Of course, that is not a perfect way to do it since that may not be finding the exact middle of a player's career in terms of PAs. But it is a reasonable approximation. Call this mid-point "Year." Anyway, the correlation between Year and Clutch/PA is -.12. That is, as time goes on, batters are doing worse in the clutch. That makes sense given the increasing use and specialization of relief pitching. The -.12 is small, though. But, as time went on, there were more players reaching the 4000 PA minimum because there were more teams and in the early 1960s, the season grew to 162 games. So any correlation will have alot more guys from the later years when everyone was doing worse in the clutch. 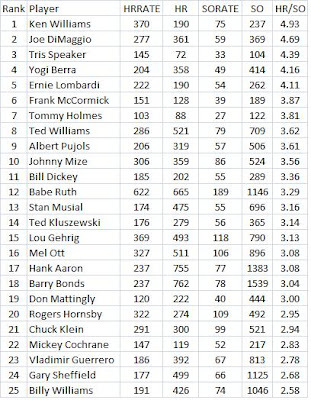 This waters down any correlation we might find (by the way, if you are interested, Yogi Berra, famous for being a clutch hitter, ranks 37th out of 758 players). But if we look at the top and bottom 25 in Clutch/PA, we can see some interesting trends. The table below shows the top 25 along with their mid-point year. If you look carefully at the mid-point years, you can see that there are more players from earlier years. But this will be summarized below. The next table shows the bottom 25. It actually turns out that the top 25 has a disproportionate number of guys from earlier years and the bottom 25 has disproportionate number of guys from later years. The next two tables shows this. The first table shows what percentge or share of the 758 players comes from each decade. 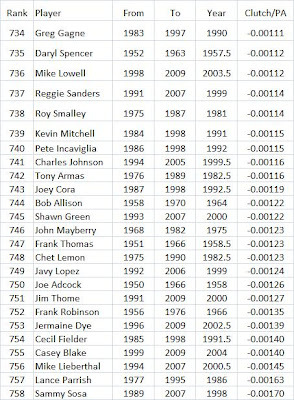 The next table shows how many players were in the top 25 and the bottom 25 from each decade and the expected number based on the percentage from the table above. 2.18 is about 8.7% of 25, for example. 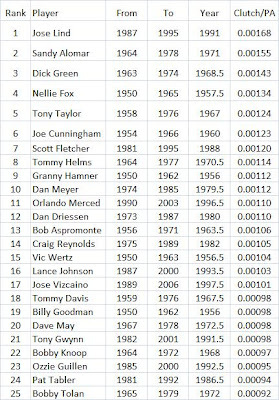 Notice that the 1950s had 4 guys in the top 25 while its expected number is 2.18. 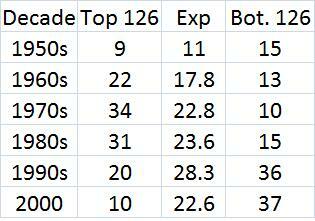 The 1960s and 1970s also had more guys in the top 25 than expected. We can also see that the 2000s had none in the top 25 even though 4.49 were expected. The 1950s, 60s and 70s did not have as many guys as expected in the bottom 25 while the 1990s and 2000s had more than expected. So it could be that it is harder to hit well in the clutch now than 4-5 decades ago. My guess is that this is due to relief pitching. I divided all the players into 6 groups since there are about 6 decades. And since 758/6 = 126.33, I looked at the top 126 and the bottom 126. 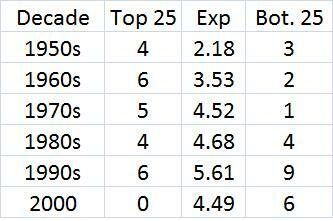 The table below summarizes how many guys from each decade were in each group along with the expected number. 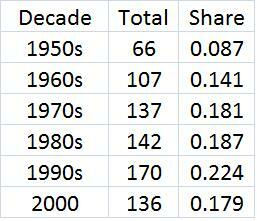 The 1950s don't have as many as expected in the top 126 and more than expected in the bottom. 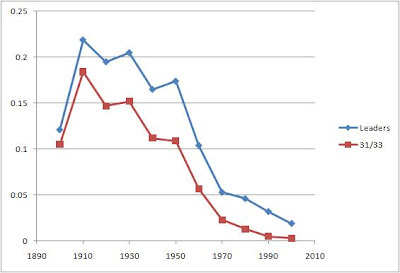 But the 1960s do have more in the top and fewer in the bottom. Same for the 1970s and 1980s. But the last two decades are very much under-represented in the top and very over-represented in the bottom. So this suggests it is harder to be a good clutch hitter in current times. 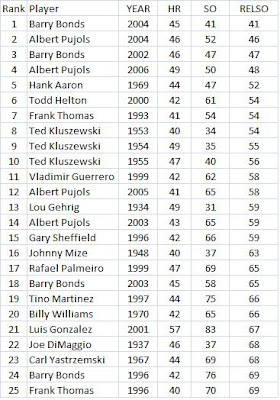 This is prompted by a post by Tom Tango (aka tangotiger) titled Best and Worst Clutch Hitters of the Retrosheet era . But Tom adjusts this by how often a hitter gets to hit in "high leverage" situations. Then that it is compared to what his WPA would be if he always hit in average leverage situations. I hope I got that right. But, of course, Tom explains it much better. That stat ends up telling us how many more games a player's team wins (or loses) because he hits better or worse in high leverage situations than he does overall. 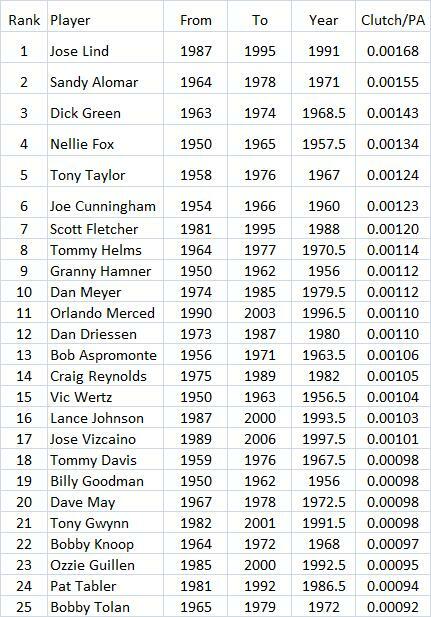 Nellie Fox is #1 with +13.4 wins since 1950. That is, by hitting better than he normally did in high leverage situations, he added 13.4 wins to his teams over his whole career. Sammy Sosa was last with -16.8 wins. That is, he hit worse in high leverage situations than he normally did and this cost his teams 16.8 wins over the course of his career. These two hitters maybe could not be more different and they may be good illustrations of what is going on with this clutch stat. So let's call Tom's stat Clutch. That's what it is called at Baseball Reference. 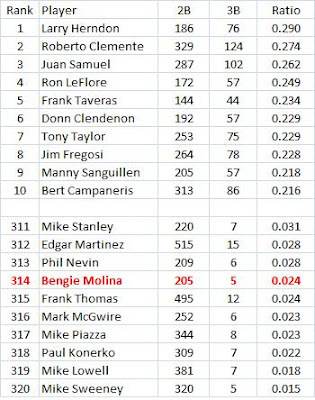 I took all the right-handed batters and left-handed batters since 1950 who had 4000+ PAs (653 players). Then I divided their Clutch stat by their PAs. I did the same thing for HRs and strikeouts. The I ran a regression with Clutch/PA being the dependent variable and HR/PA and SO/PA being the independent variables. I also added a dummy variable for being a righty (1 for righties and 0 for lefties). R-squared is .314 (meaning that 31.4% of the variation in Clutch/PA across players is explained by the equation) and the standard error per 700 PAs is .33. Mutltiplying -.00025*700 gives us -.172 (assuming 700 PAs is a full season). So simply being a righty means you will have a negative Clutch rating of -.172, meaning you will cost your team .172 wins. This could be because righties can't use the hole at first base with a runner on as well as lefties. When a runner is on first, it makes for a slightly higher leverage situation. Also, righties might have to face right-handed pitchers more often in high leverage situations than lefties face left-handed pitchers. The coefficient on HR/PA was -.0169. That times .014 = -0.00024. But that times 700 PAs is about -.166. 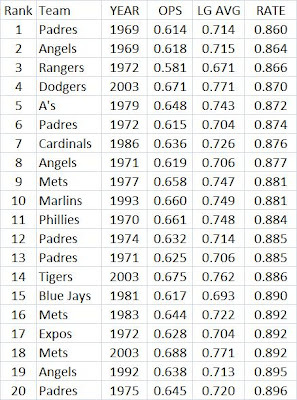 So being one standard deviation above average in HR/PA costs your team .166 wins per season. Maybe HR hitters cannot adapt well in high leverage situations since they generally just swing for the fences. But that is just a guess. Something similar could be going on for guys who strikeout alot. The coefficient on SO/PA was -.00157. That times .0449 = -0.00007. That times 700 = -.049. 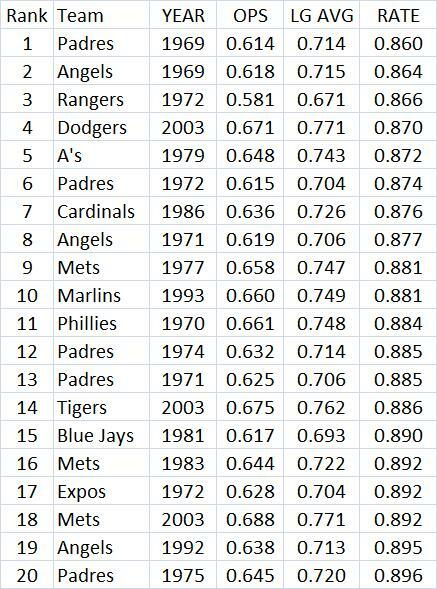 So increasing your strikeout rate by one standard deviation costs your team .049 wins per season. Maybe guys who don't strikeout alot have better bat control and they can hit the ball the hole at first base better than average or they can adapt to the situation better. Let's look at how all this affects Nellie Fox. He was a lefty, so he does not get the righty penalty. His career HR/PA = .003488. The average for all the players in the sample was .0268. So he was .0233 below that. To see the effect for the whole season, we multiply that first by -.0169, the coefficient on HR/PA from the regression equation and then times 700. This gives us -.0233*-.0169*700 = .276. So his lack of power added .276 wins to his teams each year. What about for his entire career. He had 10,035 career PAs or 14.33 seasons. With 14.33*.276 = 3.96, Fox gets 3.96 clutch wins for his whole career just due to his lack of power. For SO, Fox had a career rate of .0206. The average was .133. So he was .112 below that. Let's multiply that by -.00157 and then 700 to get .122 (-.00157 was the coefficient on SO/PA). It amounts to -.112*-.00157*700 = .122. 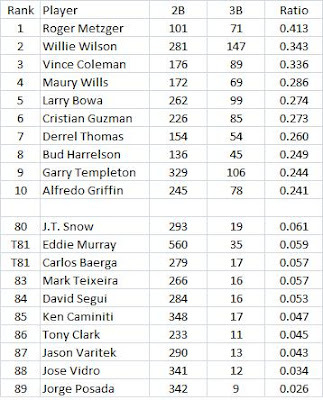 So his ability to not strike out gave his teams .122 clutch wins per season. For his career that would be 1.76 Clutch wins. Then 3.96 + 1.76 = 5.72. Just by being a low HR, low SO guy added 5.72 clutch wins. That is nearly half his total. Sosa had 9,986 career PAs or 14.14 seasons. His HR hitting cost him 5.81 clutch wins and his striking out cost him 1.54. And being a righty cost him 2.43 wins (14.14*.172 = 2.43). The .172 was how many wins a righty lost per year, as explained above. Then 5.81 + 1.54 + 2.43 = 9.78. That is more than half of his clutch losses. All of this, is, of course, an approximation. The regression is not perfect, since the r-squared was only .314. But the variables all were significant and the F-stat was 98 (that is significant and it means that the 3 variables together probably explain some part of the dependent variable). So Tom Tango's clutch stat is great in terms of what clutch stats should do but it may have some biases. But those biases might be ones teams should care about since HR hitting ability and SO avoidance ability are identifiable traits. Catcher Bengie Molina Hits For The Cycle. So How Slow Is He? He hit only his 6th career triple in the game and that was after over 4,000 ABs. That sounds slow. I have a theory that you can get a general idea of a guy's speed or base running ability by looking at his triple-to-double ratio. Some fast guys don't hit the ball hard enough or often enough to get many triples, so just using triples is not enough to gauge speed. And some guys who may not be that fast might get alot of triples more because they are good hitters. But if you look at this ratio, it tells you how often a guy made it to third relative to how many times they had to stop at second. And if you get thrown out at third, you get a double. Fast guys will turn long hits into triples more often than slow guys who must stop at 2nd. But Voros McCracken has a better way to do it. Take the following ratio: 3B/(2B + 3B). This makes it an average or a rate. It tells us what percentage of the time a batter was successful when he had a chance to make it to third with a triple instead of a double. Let's see where Molina ranks in this stat. To do that, I found all the right-handed batters from 1960-2009 who had 4,000+ ABs. The table below shows the top ten and the bottom ten. The average rate for righties was .110. That means that the average righty was 4.6 times more likely to get a triple instead of a double than Molina (.110/.024 = 4.62). The next table shows the top ten and bottom ten for lefties. Their average rate was .131. The next table shows the top ten and bottom ten for switch hitters. Their average rate was .146 (I have no idea why it is higher than the lefties' rate). "I found this photo in the AP archives yesterday and wrote about the differences from 1949 and today on the Photography blog here . It's hard to believe that this shot was made as Tommy Henrich approached home plate after hitting a walk-off home run to win the first game of the '49 series 1-0. A World Series game! For some reason all the excessive exuberance shown today by players after every little thing bothers me. Seeing this old photo just made me smile." I guess it depends on what you call old school (David Pinto's blog entry on this was titled "Old School Walk-Off"). This link shows Mazeroski’s series winning HR in 1960. I know it is different because it ended the series where as this one from 1949 was just the first game. But it looks like alot of the team came out to home plate to congratulate him as fans poured onto the field. Again, it is a little different since it won a pennant. But here is Dusty Rhode’s HR to win game 1 in the 1954 World Series. The whole team comes out to congratulate him at home plate and you also see Willie Mays jumping up and down as he rounds the bases. It is about 10 minutes long and the HR comes at the end, of course. So sometimes in the old days they had big celebrations after walk-off HRs. My first post on the Astros was Astros Offense On Record Setting Low Pace. Right now their OPS is .643 and the league average is .729. So .643/.729 = .882. That would be the 11th worst since 1969, as you can see from the table below. They have been doing better lately. In June, the Astros had an OPS of .691 while the league average was .720. That is a ratio of .96. So far in July, it is .689/.733 for a ratio of .94. The Astros have an OPS+ of 73 according to Baseball Reference. It takes park effects into effect as well as the league average (it is calculated a little differently than above). The lowest team OPS+ I found going all the way back to 1920 was 69 for the 1920 Philadelphia A's. So the Astros are close to that. I am not sure what to make from the Astro's park ratings in the Bill James Handbook. For the years 2007-9, they have a run rating of 96, meaning that the runs scored in their park is 96% of the league average. But the rating for AVG is 101 and for HRs 108. So that indicates a slightly above average hitter's park. The walk rate is 98. That does not seem like enough to offset the HR and AVG ratings to say their park is a little hard on the hitters. The error rate is only 87. That might hold down the runs. My best guess is that when it comes to OPS, Minute Maid should be a little helpful to the Astros' hitters. The Blue Jays have an isolated power (ISO) of .205 since their SLG is .445 and their AVG is .240. That is higher than the all-time record of .205 by the 1997 Mariners. 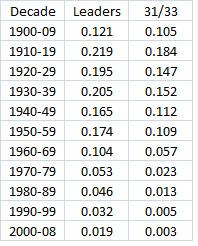 Relative to the league average, it would be the third highest since 1900, at 138 (.205/.148 = 1.38). The league ISO in the AL this year is .148. 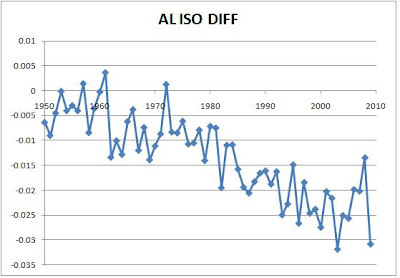 The 1927 Yankees are the highest in realtive ISO at 153. My first post on this was Blue Jays On Record Power Pace. It began with a 15-3 win over the Tigers on June 9. The Sox had 16 hits, including 3 HRs. They beat Detroit again the next day to take two out of three. In the last 30 games, the Sox have outscored their opponents 156-77. That gives them a Pythagorean winning pct of .804. In 30 games that would be 24.1 wins. All data is from Baseball Reference. The Sox hitters have a .793 OPS in these games. The following formula shows the relationship between runs per game and OPS from 2001-04 (may not be the most accurate formula for this case, but I had it handy). It predicts the Sox would score 5.22 runs per game. That is very close to what they have actually done (5.2). The Sox pitchers have allowed an OPS of .626. That would work out to about 3 runs per game or 90 total runs. They have actually only allowed 77. The Sox OPS differential is .167. The next formula shows the relationship between OPS differential and winning pct. This gives the Sox a pct of about .710. That would be only about 21 wins (which would still be very good). The big thing is that the Sox pitchers are allowing fewer runs than expected based on the OPS they have allowed. They must be doing well with runners on base in the last 30 games (but for the year they have allowed a .704 OPS overall while it is .741 with runners on). The Sox have out homered their opponents 34-17. They have won or swept 9 of their last 10 series. The only series they lost was 2 out of 3 to the Royals a couple of weeks ago in KC. They avenged that with a 3 game sweep in Chicago, outscoring them 28-8. They beat the Tigers 2 out of 3 to start this run when the Tigers were in 2nd place. But the Tigers were recently in first place until yesterday. The Sox also swept the first place Braves and took 2 of 3 from the Rangers. And last week they swept the 2nd place Angels 4 straight in Chicago, outscoring them 19-5. In the five losses, the Sox have not lost by more than 2 runs, losing all 5 by a total of 9 runs. Now if we can only get Oswalt from the Astros to take Peavy's place. Rating Hitters By Their Home Runs As A Percentage of Their Strikeouts, aka The "Splinter Score"
Just about a year ago I posted an entry called Which Players Had The Best HR-To-Strikeout Ratios? Here is that post. 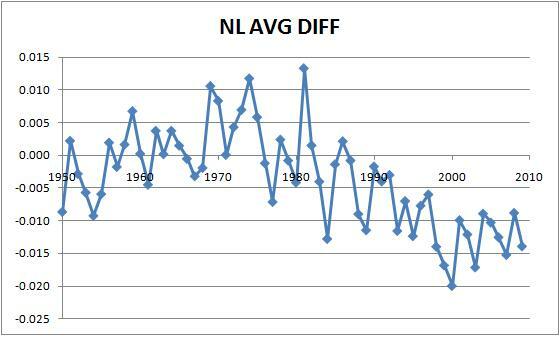 Below is a post from last year called Starting Pitchers As Relievers Over Time. Alot of people have been talking about starter Matt Garza coming in as a reliever the other day. But it was once fairly common for starters to pitch in relief. I don't claim to know all the reasons why the usage of pitchers has changed over time. But here is that post. The first post on this is right before this one. It was generated by an announcer saying something like "Sosa hit alot of HRs in when the scored was one sided." So, yes, his % his much higher in games when his team was ahead by more than 4 runs or behind by more than 4 runs. He had 1139 ABs in those situations. What if he had had his "Within 4 R" HR% in the "Margin > 4 R" ABs? He would have had 76 HRs in those cases instead of the 96 he actually had. So he would lose 20 career HRs. That would still give him 589. Notice that his HR%'s in other cases are all pretty close together. The league hit 15.75% of it's HRs in "Margin > 4 R" cases. What if Sosa had the same %? Well, 15.75% of 243 is about 38. He actually hit 44 in "Margin > 4 R" cases. So we should take 6 HRs away from him. That would leave him 237 for the whole 1998-2001 period, still an amazing total. Now 38/237 = .16 or 16% of HRs in "Margin > 4 R" cases. If I dropped him down to 37/236, it would be .1568. So a loss of about 6 HRs is fairly accurate. So, bottom line, if Sosa matched the league average in when he hit HRs according to run margin, he would not lose very many HRs. How could anyone fault him for this? Was Sammy Sosa A Clutch Hitter From 1998-2001? While watching the Ranger's broadcast of their game vs. the White Sox last night, one of the announcers said something about how Josh Hamilton's HRs are usually very important, like the one that put them ahead 2-1. Then he said something about Sammy Sosa like "in those years when he was hitting 60 HRs, he alot of them when the game was one sided." I don't know if that is true. Here is one way to look at it. Sosa had a HR% in non-close and late situations of 10.12% during these years. In close and late (CL) situations, it was 8.85% (so he dropped off, but that is still much higher than most players in CL situations). But hitters generally have a lower HR% in CL situations. From 1991-2000, it was 2.99% in non-CL cases and 2.63 in CL situations, for a decline of about .0036. So let's suppose that Sosa's differential should have been only .0036, then he should have had a 9.76 HR% in CL situations. He had 384 CL ABs. A 9.76 HR% would give him 37.47 HRs in CL situations. He actually had 34. So maybe he should have had 3.47 More HRs in those years, if he had not "choked" in the clutch. This is not a big deal. Conversely, if we add .0036 to his .0885 CL HR% to get his expected non-CL HR%, we would have a HR% of 9.21%. In his 2,165 non-CL ABs, he would hit 199 HRs. He actually hit 219 in non-CL situations during those years. If we take away 20 HRs over these four years, he ends up with 233 instead of 253. That is still an average of 58.25 per season. Pretty incredible. But we can easily imagine that Sosa had to face some very tough relievers in those CL situations, who might have been told to not give him much to hit. The following table summarizes his stats in various situations in each of the four seasons. 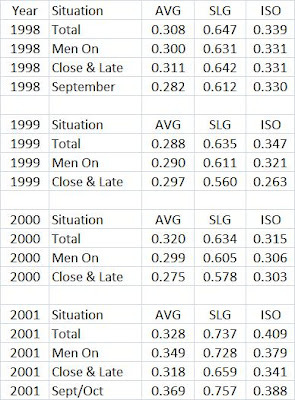 Sept and Oct data are shown for 1998 & 2001 because in those years the Cubs were fighting for a playoff spot. In general, I think the numbers show that he hit very well with runners on or in CL situations or late in the season when the Cubs were trying to make the post season (they finished last in both 1999 & 2000). Sosa hit alot of meanigful HRs in these years. There is nothing misleading or deceiving about his performance or his stats. To see what the normal clutch/non-clutch differentials are, go to General Clutch Data. Did Koufax Have The Best Peak Ever?